The interior design of this courtyard restaurant club is in absolute consonance with the architecture of its shell creating just the right vibe of an unmistakably ‘laid-back’ space. Walk in through a cluster of balmy trees and travel into a completely different land an alfresco setting that exudes Charm! Unplugged Courtyard Gurgaon, transport its customers into the climes of Goa right in the heart of Gurgaon’s precinct of Udyog Vihar. All that’s missing is the feel of the waves lashing one’s toes. The space is welcoming, intimate and quite effortlessly dramatic. Nestled in a leafy, serene lane in Gurgaon’s upscale Udyog Vihar, Unplugged Courtyard is understatedly elegant and generously spaced over 15,000 square feet spanning two levels, reflects an urban chic vibe and the best part there are no parking blues! With clean lines and welcoming seating, the décor is balanced between chic and comfortable. The restaurant has a capacity of over 375 covers, and also boasts a terrace area, a secret garden and a quirky bus give the space a distinctly ‘comfy’ feel, without ever seeming over-designed. It would be most appropriate to say that the interior design of this courtyard restaurant club is in absolute consonance with the architecture of its shell creating just the right vibe of an unmistakably ‘laid-back’ space. Unplugged Courtyard Gurgaon sets a benchmark for its pioneering food and often-irreverent take on the idea of traditional cuisines. As important as food, design and music, the bar keeps abreast offering trendy and affordable yet fabulous tasting cocktails. 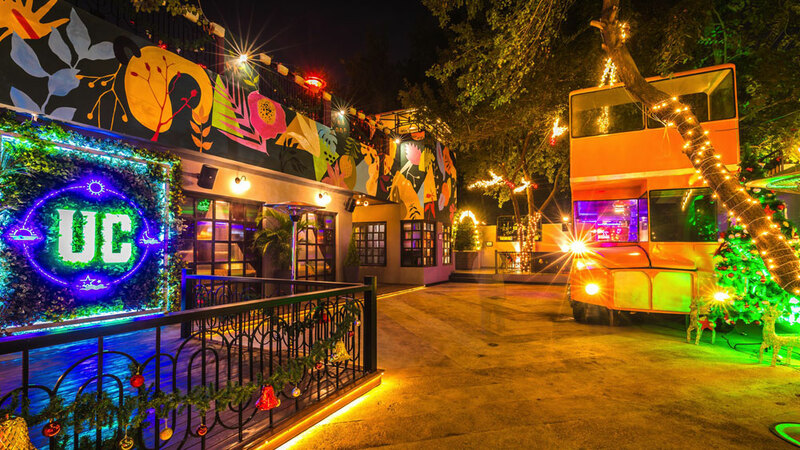 Having firmly established itself as a quality chill zone destination in New Delhi, it now opens its doors to the people of Gurgaon. Corporate Chef Akshay Bhardwaj is no stranger to immaculateness. He shares his exceptional take on modern day comfort food combining ingredients that marry the Chef’s progressive approach to World cuisine. His focus in every dish is always prime ingredients; his dishes elicit the real flavour of every natural element. Laal Maas Ki Lahori Seekh for example marries mutton mince with Rajasthan spices; served with walnut Labneh, this is an addictive blend of Indian and Middle Eastern influences. Nothing encompasses South East Asia more than that distinctively delicious entity known as Thai Basil Chicken, and the flavour-explosion that is the Khow Suey topped with fried onion and garlic. One of the chef’s favourite is the Bhuna Gosht with saffron Parantha. A fresher rendition of the classic version, it makes for a perfect bite, with marinated onions providing a satisfying contrast to the flavour and texture of the meat. Desserts like the French toast with ice cream in a rich banana cake, and Churros with chocolate sauce promise potent doses of decadent comfort. The crockery here is cheerfully matched and, perfectly complements the honest wholesomeness of the food. Embark on a culinary journey of a lifetime at Unplugged Courtyard Gurgaon. The tastefully designed cocktail bar is trendy and our bar menu enticing and indulgent. It is the perfect setting to savour our first-rate cocktails or even a glass of wine in the early evening through to midnight. Food is as important as the design and music and, for once, the bar has kept abreast. It’s trendy and affordable and, above all, high on taste! There is never a dull moment here. The music is buzzy and you don’t make a reservation at Unplugged Courtyard Gurgaon you saunter in whenever the mood grabs you. The vibe is cool and new, yet, familiar.